His first, best masterstroke is also his simplest: these people don’t particularly like each other and don’t even want to be in the same room together. Would Tony Stark (Robert Downey Jr.), a cocky billionaire, have anything to do with Steve Rogers (Chris Evans), an old-fashioned soldier stuck in a bygone era? Not really, especially when you consider that Tony’s dad knew both of them and liked the boy scout better. What would Bruce Banner (Mark Ruffalo), turning a new leaf by helping the helpless and ignoring his true power, have in common with god of thunder Thor (Chris Hemsworth), who does nothing but embrace his power? Pretty much nothing. The reason they’re forced to unite is Thor’s mischievous brother, Loki (Tom Hiddleston). Having attempted to steal what he believed was his rightful throne in Asgard, Loki now seeks to dominate Earth, the planet that his brother so dearly loves. Nick Fury (Samuel L. Jackson), director of shadowy government agency S.H.I.E.L.D., gathers the heroes together. They spend the first half of the movie stuck in their ways, bickering and at odds with one another. That bickering, by the way? A pleasure for your ears. Whedon’s dialogue has always been one of his strong suits, from the quips of Buffy the Vampire Slayer to the futuristic Old West speak of Firefly, and you can feel how much fun he had just throwing these guys together and letting their personalities clash. It doesn’t hurt that his cast oozes with talent. In particular, the always charming, always sarcastic Downey Jr. tears into Whedon’s words with relish. Hemsworth has some great Shakespearean sparring to do with Hiddleston, but he also reveals a natural humor that wasn’t always apparent in Thor. Evans could easily have been the squarest of the bunch as Captain America, but Whedon–who did an uncredited rewrite of Cap’s solo film–turns that squareness into something down-to-earth and appealing. Perhaps the most impressive of the bunch is Ruffalo, who adds new layers of humanity to the screen incarnation of Bruce Banner; instead of brooding on his own problems, he’s a big-hearted guy trying to conceal his dark nature. By the time things go to hell and Iron Man, Captain America, Thor, and the Hulk have to get down to some serious Avenging, we know these characters well enough that we can anticipate their responses and delight in the ways Whedon pairs them off and builds their relationships. By the way, if you haven’t seen at least a couple of the five previous Marvel films, I suppose you could enjoy this one at face value, but this is basically their season finale, so prior experience is deserved as well as rewarded. And if you know your Joss Whedon (if you’re reading this blog, you probably know that I do), you know that no one does season finales better than this man. 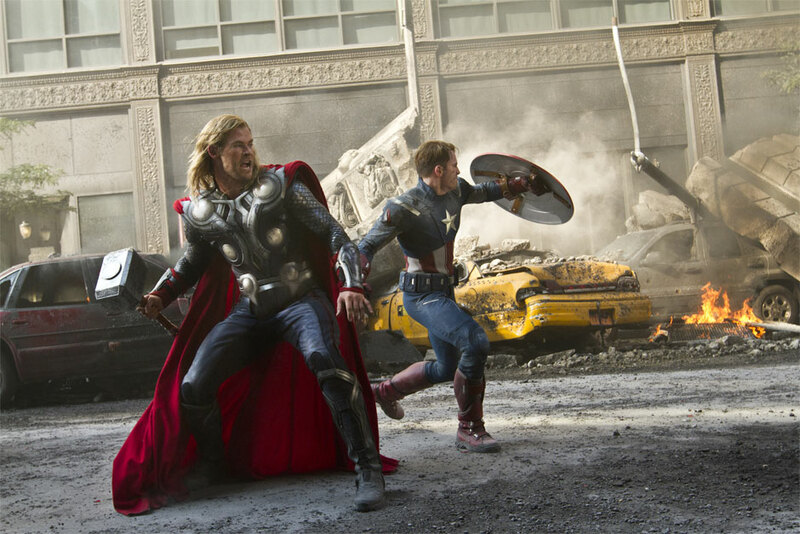 The film is structured as a series of increasing escalations, from Loki’s arrival at S.H.I.E.L.D. 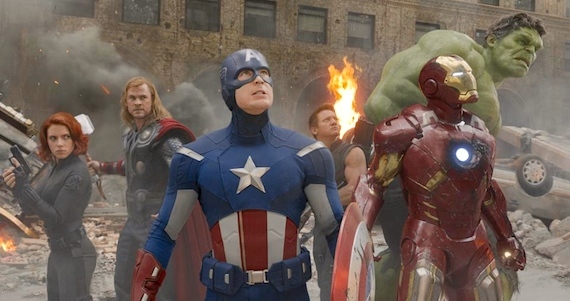 headquarters via the cosmic Tesseract cube, to superhero-on-superhero battles, to an explosive mid-air action sequence, all before a truly enormous and inspired finale. It feels at once much more epic and much tighter than the origin stories that came before. Whedon has a lot of heavy-lifting to do, and lift it he does, but there are a few smaller elements worth focusing on. S.H.I.E.L.D. spy Black Widow (Scarlett Johansson), previously seen disguised as Tony’s assistant in Iron Man 2, has a much more substantial role in The Avengers. Whedon has a history of writing strong female characters (you won’t find a more compelling feminist manifesto in the last couple decades of genre work than Buffy), and it’s to his credit that Black Widow leaps from underwritten background player to stylish, witty heavy hitter. Johansson, giving her best performance in years, is more than up to the task. Another distinctly Whedon theme that gets worked into the movie is the inherent distrust of authority, this time of S.H.I.E.L.D. Certain practices are called into question which throw new light on S.H.I.E.L.D.’s role in these films. Loki is a master manipulator, and plays the team against one another, but Nick Fury is just as manipulative, even if his goal is more virtuous on the surface. If I have any quibbles, they’re to do with the film’s beginning; I mean the very beginning, when Loki arrives on Earth and proceeds to destroy the S.H.I.E.L.D. facility. Compared to the rest of the film, it’s weakly staged, and gets things off on unsure footing. Jeremy Renner has formidable presence as stoic archer Hawkeye, though I question something that’s done with his character in the opening. It prevents us from getting to know him for a good deal of the movie, especially considering his one previous appearance in this universe was a brief cameo in Thor. Whedon’s always been better at middles and endings than beginnings, though, and he quickly rights himself. Something which might rankle others but didn’t bother me is the lack of explanation surrounding the Chitauri, the alien army which Loki enlists to help him take over Earth. It’s the classic situation wherein a king recruits an army to help him invade a land, and I didn’t really need to know anything beyond that. In fact, the whole deal with the Tesseract is one huge MacGuffin to spur on the characters and the action. I like Hitchcock, so I’m okay with MacGuffins as long as they result in engaging films with fascinating characters. This one does. As someone who’s been enamored of both Marvel Comics and Joss Whedon for a very long time, their cinematic mind-meld feels like a match made in heaven. Whedon discards the earlier films’ weaknesses, their limp third acts and most impressively, given the insane amount of pieces at play here, their sense of too much effort for too little gain. This is a wild, beautifully assembled comic book brought to life, exploding with bright colors and generosity of spirit. It is very funny, plays off everything we’ve come to know about these characters, and progresses them just enough so that they can continue their adventures elsewhere. And what of that whole question of what it means to be a hero? Well, heroism involves sacrifice, especially when you’re part of a team. Not only do others have to sacrifice for your benefit, you have to sacrifice too. Sometimes those sacrifices can hurt. The heroes in The Avengers desperately need to learn that. They do, in the most satisfying way imaginable. This entry was posted in Movie Reviews and tagged action, batman & robin, batman begins, black widow, buffy, buffy the vampire slayer, captain america, catwoman, chitauri, chris evans, chris hemsworth, christopher nolan, comic books, comics, elektra, fantasy, film, firefly, graphic novels, hawkeye, hulk, iron man, iron man 2, jeremy renner, joss whedon, loki, mark ruffalo, marvel, marvel comics, movies, nick fury, robert downey jr, samuel l jackson, scarlett johansson, sci-fi, science fiction, spider-man 2, superhero, superheroes, the avengers, the dark knight, the dark knight rises, thor, tom hiddleston. Bookmark the permalink.